It is a well-known fact that there are several different themes to be found in the Mass and Office of January 1st, which is simultaneously the feast of the Circumcision, the octave of Christmas, and a celebration of the divine maternity of the Virgin Mary. Another element is one of protest against the excesses of the pagan celebration of the New Year; anciently, this was expressed in the Roman Rite by a special Mass “ad prohibendum ab idolis – to prohibit from idols”, also to be sung on that day. As I noted in an article earlier this week, liturgical scholars in the pre-Conciliar period mistakenly believed that the commemoration of the Circumcision was adopted into the Roman Rite from the Gallican. This leaves the question of how the Roman Rite celebrated January 1st before this took place. In 1933, Dom Bernard Botte OSB proposed, on the evidence of some ancient antiphonaries, that in the first half of the 7th century, the day was celebrated in Rome as a feast of the Virgin Mary. 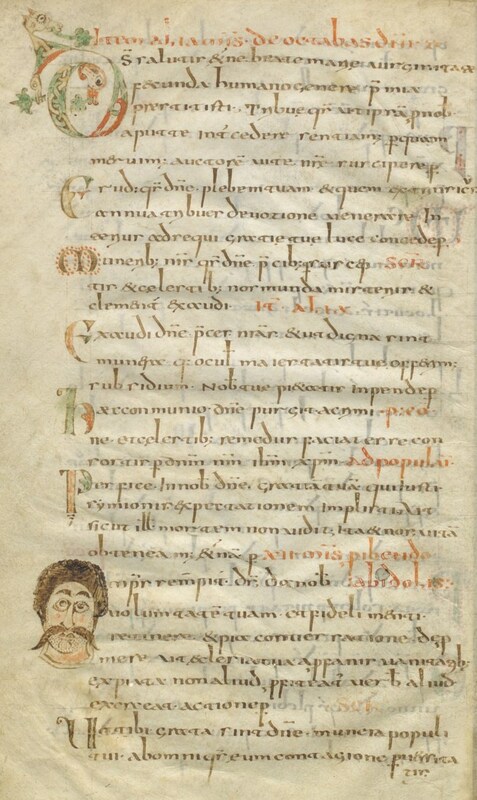 According to his theory, it was then transformed a few decades later into the “octave of the Lord”, the title which it has in the oldest manuscripts, and still later, renamed as the Circumcision. Although his deduction was not universally accepted at the time, it was of course the theory behind the invention of the Solemnity of Mary, which replaced the ancient celebration in the post-Conciliar reform. 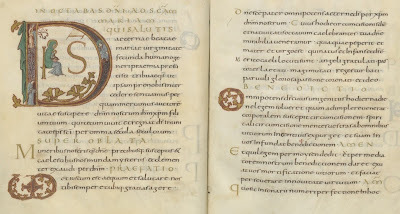 Folio 9r of the Gellone Sacramentary, with the second Mass for the Octave of the Lord, beginning with the prayer Deus qui salutis. 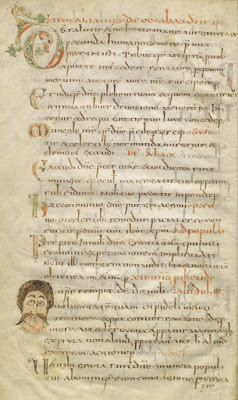 The Mass “ad prohibendum ab idolis” begins next to the fellow with the handlebar mustache; there is very often no discernible connection between the liturgical text and the marginal illustration, as is the case here. This second Mass has a second collect, two secrets (but no preface of its own), and a post-communion, none of which mention the Virgin Mary. It also has a prayer “ad populum”, like those said in the Roman Missal on the ferial days of Lent, which refers to “Simeon the Just”; this relates to the longer Gospel from Luke 2 (verses 21-40 or 21-33) attested in the ancient lectionaries for this day. The first Secret (Muneribus nostris) and the Postcommunion (Haec nos communio) of this Mass are also those found in the Missal of St Pius V, but without the words “intercedente beata Virgine Dei Genitrice Maria” in the latter, which are a later interpolation. Most of the Gregorian Sacramentaries of the post-Carolingian period (mid-9th – 10th centuries) reproduce this same group of prayers, taken as a unit from the Gelasian. In all of them, however, the Mass is entitled “the Octave of the Lord,” and none of them uses the title found in those antiphonaries which give a Mass of the Virgin, known from its Introit as Vultum tuum. Those among them which retain the proper preface for the day also change its beginning, from “as we celebrate today the octave of His Birth” to “as we celebrate the day of His Circumcision, and the octave of His Birth.” In this period, we also find a solemn blessing added to Pontifical Mass after “Pax Domini sit semper vobiscum”; this is still noted in the last editions of the Sarum Missal, and was the inspiration for the optional solemn blessings in the post-conciliar reform. In the Sacramentary of Drogo, bishop of Metz (845-55), the three proper invocations of this blessing for January 1st all refer solely to the Circumcision, and not at all to the Virgin Mary. Folios 32v and 33r of the Sacramentary of Drogo, Bishop of Metz, 845-55 (Bibliothèque nationale de France. Département des Manuscrits. Latin 9428) showing the first two pages (out of three) of the Mass of the Octave of the Lord: the Collect, Secret (called Super oblata), the Preface, and the solemn Pontifical blessing. In short, then, the Marian elements in the Mass of January 1st consist of a single Collect, one which was certainly very widely diffused through the many Uses of the Roman Rite, and a later, parenthetical interpolation in the accompanying Post-Communion, and occasionally also in the Secret. The Virgin Mary is certainly more prominent in the texts of the Office than of the Mass, and this is often adduced as evidence of the day’s original Marian character. The Catholic Encyclopedia exaggerates when it says, in its article on the feast of the Circumcision, “in the Office, the responses and antiphons set forth her privileges and extol her wonderful prerogatives. 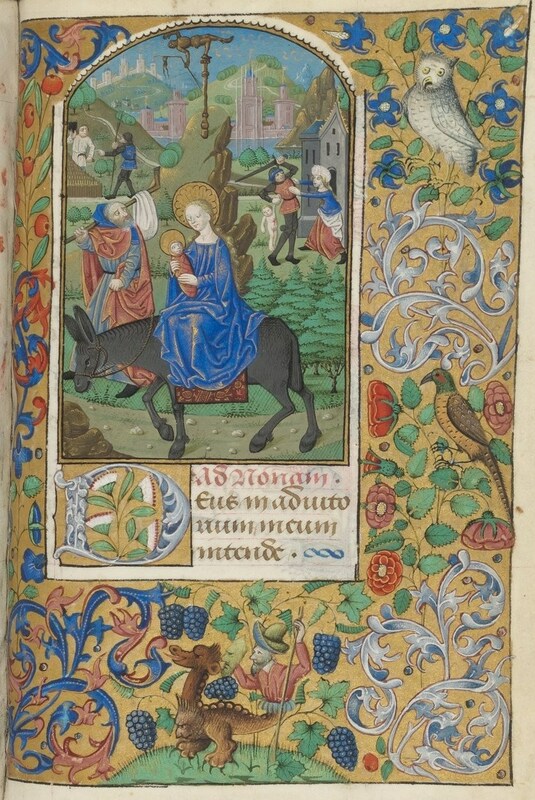 The psalms for Vespers are those appointed for her feasts, and the antiphons and hymn of Lauds keep her constantly in view.” In the Roman Breviary, the antiphons of Matins all refer solely to Christ; it is tempting to speculate that the antiphon of Psalm 23, “Be lifted up, ye everlasting doors, and the King of glory shall come in” refers to the ancient custom by which the account of Christ’s Presentation was also read at the Mass. The first three responsories in the Roman Breviary also refer only to Christ, and five to both Him and His Mother, but in the Monastic Breviary, the proportion is 7 and 5. 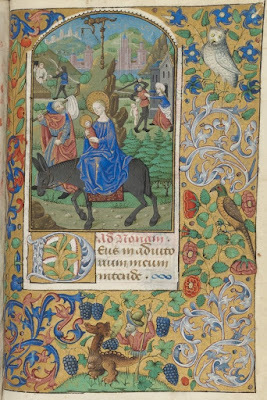 Among the antiphons for the Psalms of Lauds, the Virgin is mentioned in passing in the first two, and the subject of one clause in each of the last two; only the middle one, “Rubum quem viderat” is principally about Her. The hymns are simply repeated from Christmas. Of the three antiphons for the Gospel canticles, that of Second Vespers, Magnum hereditatis mysterium, mentions Her prominently, but the other two not at all. As stated above, it is a common feature of the Western liturgies of January 1st to have some element by which the Church responds to the riotous pagan celebrations of the New Year. This theme is very prominent in the Ambrosian Rite; most of the antiphons of its Office for the day refer to it, and not to the Birth or Circumcision of Christ, nor to the Virgin Mary. Even here, however, the prayers of the Mass and Office are all taken from the old Gelasian Masses of the Octave of the Lord, and not from that “to prohibit from idols.” The only one that mentions the Virgin Mary is the Collect Deus qui salutis; in the rest of the Mass and Office, She hardly figures at all.